What is a reasonable period to make plans for? How do you make plans in an environment of constant changes? Our experience tells us one thing – be flexible. Quickly adapting to the new situation and letting go of old plans is the key. You shouldn’t make very specific long-term plans. Agile, scrum, Trello, sprints – these and many other keywords mark today’s approach to planning. It’s all about the constant revision of tasks at hand and updating the plans accordingly. You’ve got to launch your product as quickly as possible, get customers on board, and then smooth it out on the go. In planning, flexibility means that everybody knows exactly what goal they are trying to achieve, but also that the path to it is not carved in stone (especially when it comes to software development). There are too many variables that can not be predicted – development can take longer than expected, user feedback can turn everything upside-down, core ideas themselves can change during the process. I’m sure you’ve seen it happen. Business plans formed the core of every starting enterprise some years ago. It wasn’t about your 30-second pitch. It was all about the length and depth of your Excel sheet – how many employees are you going to have in 3 years? What do you mean you don’t know? Are you prepared at all?! Don’t get me wrong, a well thought out business plan is still a good tool, but not for proving a concept, and not for a basis for planning. It’s great for flexing your brain and for going through different scenarios and business models. It’s great when it helps you realize that a new BMW after the first year in business might not be such a good idea. But you shouldn’t invest too much time in predicting the future. It’s better to start building the future step-by-step. For us, it’s three months. And we’re not shy about preaching it. That’s why the Teamweek timeline zoom-levels are divided into weeks, months and 3-month views. Our own 8-year experience in developing Toggl (and more recently, with Teamweek) shows that these three zoom levels are the most useful and relevant periods, for which planning is reasonable – and realistic. Have clear goals. Depending on your product, these can be measurable in numbers (e.g. 13k paying users by the end of the year), defined by development phases (“we will launch beta in January 2016”). They can even be somewhat more general (“in 2 years we will have enough customers to cover the running costs”). But there has to be something that is motivating and clear enough to follow. And the bar must never be set too low. Make short-term plans. For us, it’s three months (here’s an example of this in action), but it can be a bit shorter or longer. The main point is that the planning period must be realistic. Everybody in the team needs to prioritize their tasks and be able to reasonably evaluate if they can be done. Trust your people. Do not assign tasks for the planning period that can not be done. Discuss and decide tasks and goals with the team. Too many tasks, dependencies, resources, comments etc. becomes nothing more than clutter. 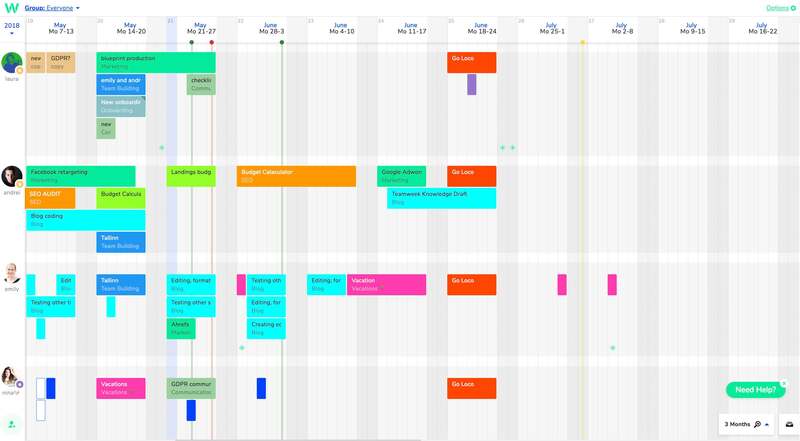 This is also why we use Teamweek’s simplified Gantt chart timeline. It makes it easy to see what everyone is working on. Try Teamweek for free here. Let your people fly. No, don’t fire them, that wouldn’t be very wise. Let them do their thing. Learn to let go of control. Have weekly team-meetings to see what has been done and what will be done during the next week. Recalculate plans, if necessary. It’s not the end of the world if you do – you’re being flexible. Think in the moment. Problems, new ideas, customer suggestions – everything is easier to deal with when you are not stuck with long-term plans. These are the things that influence the development (and the whole concept) of Teamweek. Do you have any extra suggestions, or perhaps another point of view? Feel free to share your thoughts in the comment section and our social media! Join our free Modern Management newsletter for more tips and tricks to help you manage your team, your projects, and your time. Tarmo likes the Internet and writing. Generating leads for Teamweek requires both, so it's dream-work come true. His background is culture management and he's constantly promoting some strange performances to others. He also likes cars, but that's not cool, so he keeps quiet about it.